Alisa Yoffe (b. 1987 in Tashkent), artist. She studied at the Institute of Contemporary Art in Moscow (2007–2008) and the Moscow Museum of Modern Art’s Free Workshops (2006–2007), and attended Anatoly Osmolovsky's lecture course (2008). Since 2008 Alisa Yoffe has been participating in numerous solo shows and group exhibitions, such as the Garage Triennial for Russian Contemporary Art, Lost in Translation – a collateral event of the 55th International Venice Biennale, the Third Ural Industrial Biennial of Contemporary Art, the Fifth Moscow Biennale of Contemporary Art, and the Fifth Moscow International Biennale for Young Art. 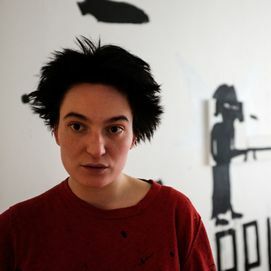 Alisa Yoffe’s works are in the collections of the Perm Museum of Contemporary Art, Russia; the Stella Art Foundation, Russia; the V-A-C Foundation, Russia; the Vladimir Smirnov and Konstantine Sorokin Foundation, Russia; Horvath Art Foundation, Hungary; and the Klaipėda Culture Communication Centre, Lithuania. She lives and works in Moscow.